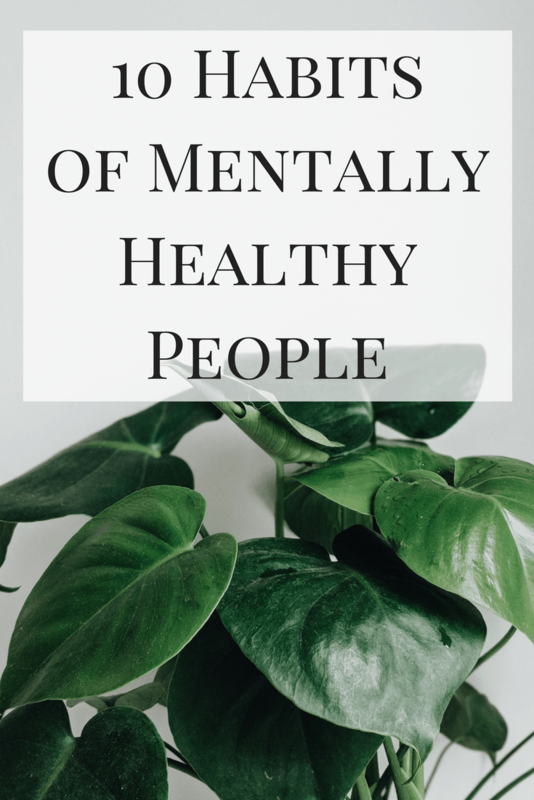 Last month I wrote a post about the habits of physically healthy people and it’s only fitting that I follow up with one about habits of mentally healthy people. As you know, I’ve been through my fair share of both mental and physical health issues, so many of these are also learned from personal experience. If you have any to add to the list, make sure to leave your experience in the comments. Enjoy! Boundaries were never my strong suit, and I often felt used, resentful, or any myriad of negative emotions. Figure out what you are and aren’t willing to do, people and situations that you’d rather stay away from, and anything that may affect you negatively. Among the boundaries I had to learn to set were certain places I couldn’t hang out and people from my past who were still stuck in their addictions. On an emotional level, I removed myself from negative situations with toxic people and I learned how to stand up for myself by explaining what I would and would not tolerate. Mentally healthy people understand their boundaries — and enforce them. The thing about your mental health is that it’s yours, which means that it’s your responsibility to take care of it. Take time to work on improving yourself and change destructive habits. Ask yourself tough questions and get to the bottom of repetitive destructive behaviors. Learn your likes and dislikes. Figure out what you value and hold onto that. Knowing who you are and what you stand for will help you gain confidence and set those boundaries. If you have trouble doing it yourself, talking to a mental health professional may help. This doesn’t mean that you can never feel negative about anything, but for the most part, mentally healthy people try and see the positive in things. It’s fine to have a bad day or a tough time, but continuously living with a negative state of mind will only lead to more negativity. This is such a huge self-sabotage and I was guilty of it for 80% of my life. Playing the victim takes any responsibility off you in any situation, allows you to live in a self-constructed pity party, and keeps you stuck. You don’t learn to take responsibility for things which prohibits you from growing as a person. It is emotionally draining for people close to you and can cause them to become fed up with the behavior. Learn to stop blaming outside people and things for where you are in life and realize that you control it. I am still a work in progress with this one considering that I spent a very long time shoving any negative feelings as deep down as they would go. If I’m not careful, I fall back into the habit of pushing them aside in favor of better feelings or simply an attempt at not feeling uncomfortable. Every time I do this, I’m either haunted by a situation for far longer than if I had just worked through it or the emotions come out sideways in some other confusing way. Even though it might cause discomfort, feelings are a normal part of life. They’re not facts; they are simply a natural reaction to whatever is happening in your life. They won’t kill you, and it’s important to work through them in order to process what’s happening and move on. This is easier said than done, given that we live in a media-driven world where we are constantly bombarded with carefully curated social media posts. We compare our jobs, our finances, and our looks. The key to maintaining your mental health in this arena is to simply stop the comparison. Remember that social media is a highlight reel. Remember that we have no idea what is happening in another person’s life despite what is shown on the exterior. Make it a point to take breaks from social media. Put your phone away at night. If you’re really having a tough time, delete any apps that may be sucking your time. Remind yourself that everyone is on their own journey. Mentally healthy people move on from negative situations in their lives. This doesn’t mean that they forget, but that they don’t let one instance hold them back from growth and happiness. When I was released from jail, I could have easily remained stuck in the situation I was in rather than learn from it and find a way to overcome the circumstances I had put myself in. Forgiveness is another part of not dwelling. When Neil and I almost separated, we caused a lot of hurt to each other. Rather than stay together and continuously throw those hurts back at each other, we decided to start anew. We forgave and worked together to figure out how we would continue on from there. There is something that happens when you put pen (or pencil) to paper. Some people choose to journal electronically, but there seems to be a better mind-body connection with physically writing down your thoughts. Journaling can be done at any time and in any fashion; there’s no right or wrong way to do it. Writing can help you process your thoughts about a certain situation, reflect on what you are grateful for, or any number of mentally healing things. Other people are a huge part of our lives, whether we like it or not. We interact with others on a daily basis, and it’s important to realize that we can’t continue through life without anyone else. Make a friend, find a partner, or just reach out to family because we all need someone else in our lives. Friends, family, and loved ones help us see the big picture, show us love, and support us through tough times. One of the most important things you can do to help your mental health is communicate. When I was using, my thoughts were often irrational and misguided. If I had had someone to communicate with, they could have helped me see things in a way I wasn’t able to. Whether you choose to communicate with a friend, family, or mental health professional, doing so is crucial in caring for your mental health. How many of these habits of mentally healthy people do you do?